One of the earliest Rapp & Rapp theaters, the Al. 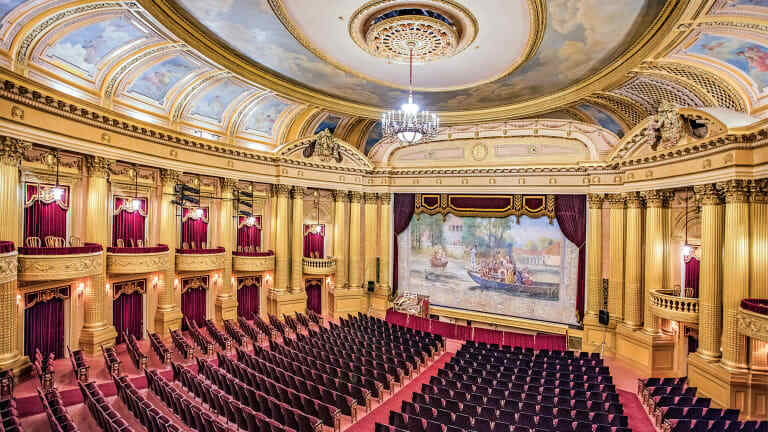 Ringling Theater in Baraboo, WI, has been restored to its original elegance by Isthmus Architecture. Built in less than year in 1915 in Baraboo, WI, the Al. Ringling Theatre was a gift for the city from the eldest of the famous Ringling Brothers. 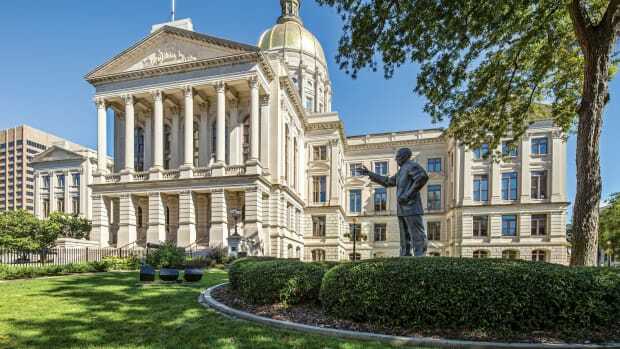 The elaborate 16,325-sq.ft. 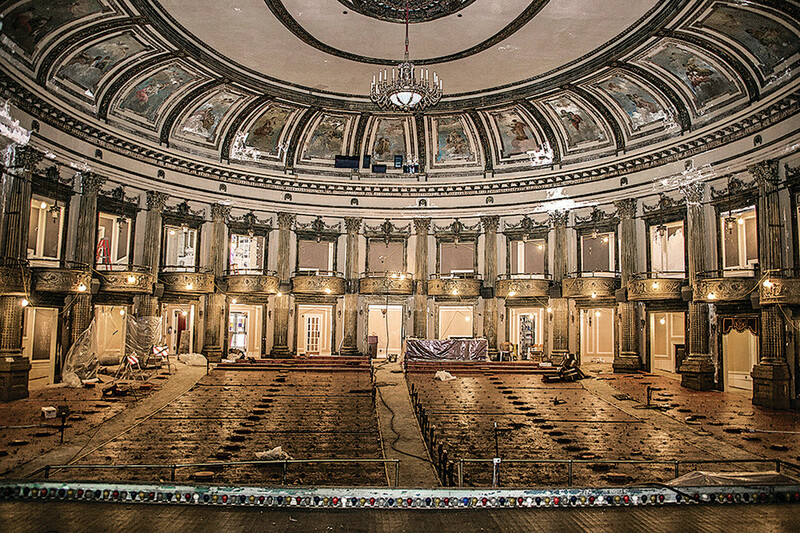 oval-shaped theater was one of the earliest theaters designed by Rapp & Rapp of Chicago and is adorned with ornate features such a domed ceiling with a cloud painting, a series of historic murals, velvet draperies and a rare fire curtain with a hand-painted mural. The two-story theater now seats 644 on the main floor and 70 in 17 private boxes in the mezzanine (originally known as the entresol level), considered the more elegant area. 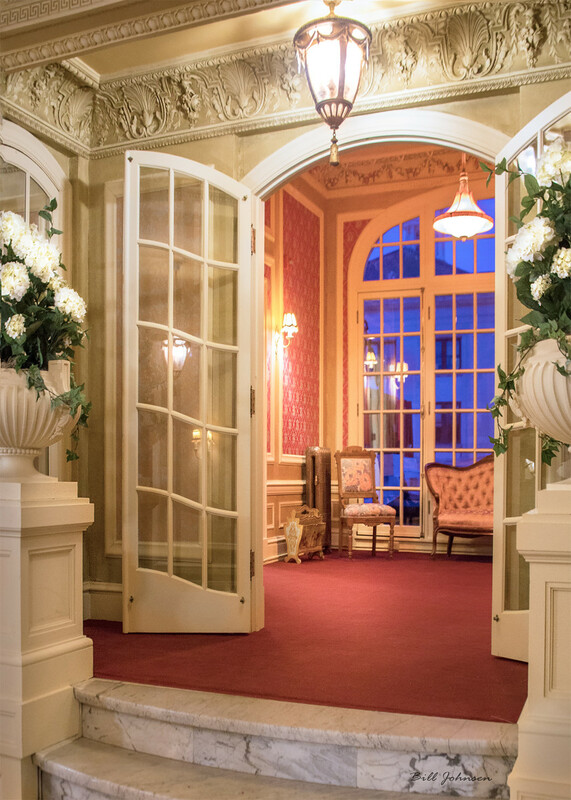 There are also two horseshoe shaped foyers, one on each floor, as well as restrooms and lounges on each floor. Now restored, the Al. 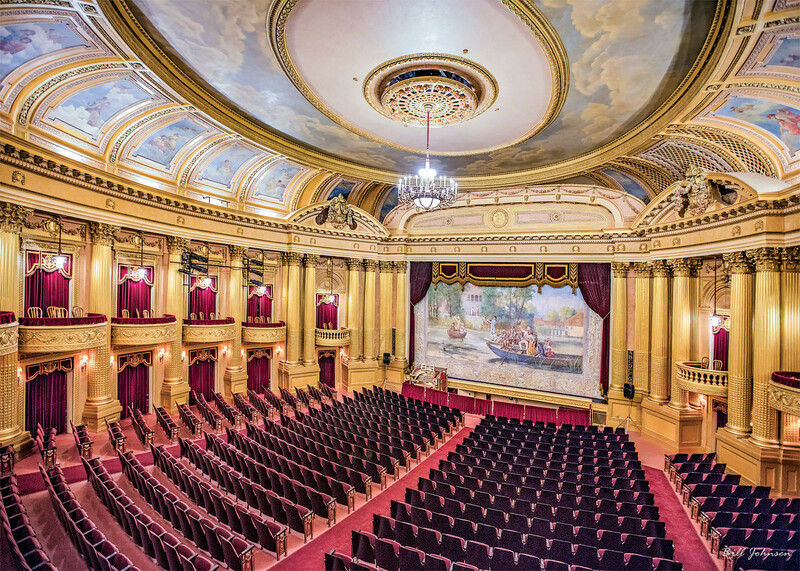 Ringling Theatre in Baraboo, WI, is ready to serve the community for another 100 years. 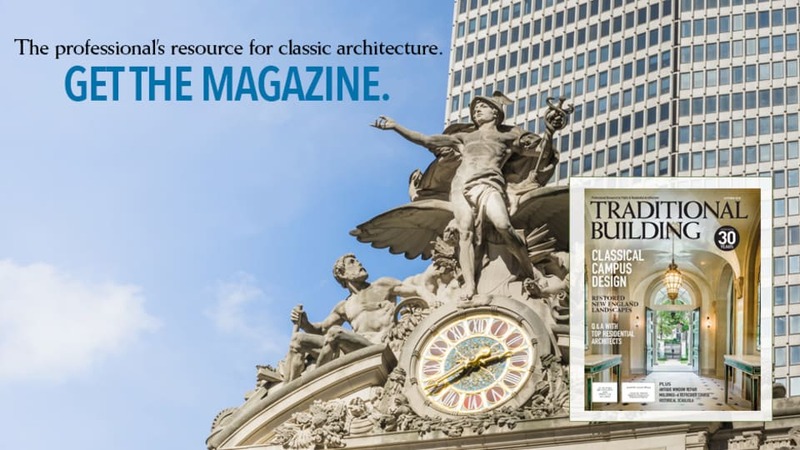 The restoration was led by Isthmus Architecture, Madison, WI. Note the fire curtain and the murals. 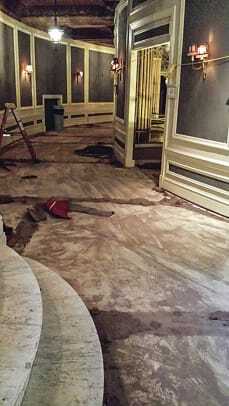 The theater had been in various phases of restoration for about 28 years, she adds. The façade was done decades ago, and then the roof repair and now the interior. 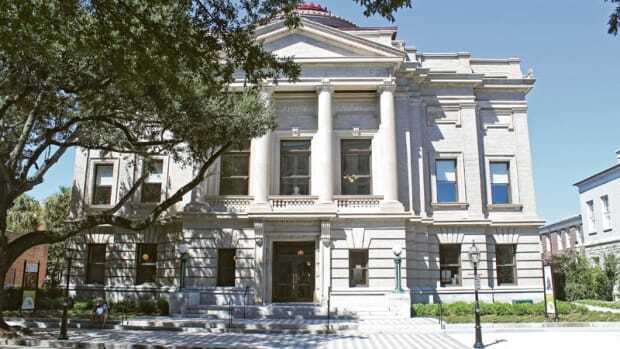 The Historic Structure Report was completed in 2012. One of the distinguishing elements of this theater is its oval plan, which prevented it from being divided into a multiplex, Rött notes. 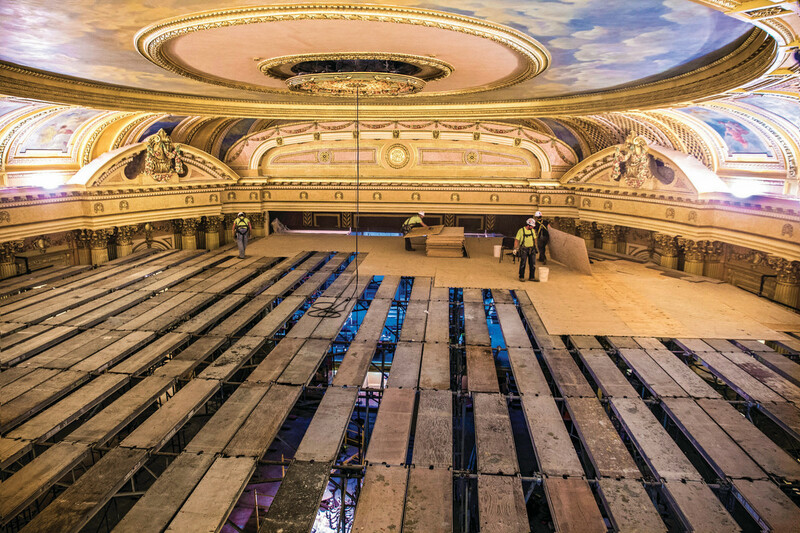 Although the focus was on the interior, the restoration started with roof, ultimately re-roofing the entire theater, followed by the addition of a sophisticated fire-sprinkler system. The original fire suppression system was no longer functional. The board was concerned about sprinkler piping because the theater had suffered so much water damage to the elaborate interior finishes, but ultimately this system satisfied all of the related agencies and the board agreed to it. 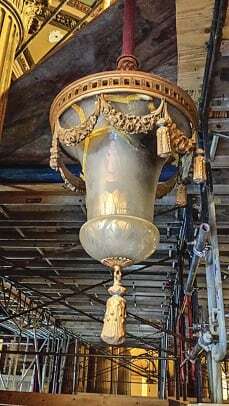 The workers from Badger Ladder and Scaffolding constructed scaffolding in the theater so Evergreene Architectural Arts could work on the murals. This area became known as the dance floor. As for the fire curtain in front of the main drape, Rött notes that in most theaters the public never sees the fire curtain. “A few, like this one, had murals painted on the face of the fire curtain,” he says, noting that the Al. Ringling Theatre boasts elaborate fire-curtain mural known as Serenade au Petite (Petit) Trianon. It was in fairly good condition, requiring only cleaning and repairs. The restored ladies lounge on the mezzanine (formerly known as the entresol) level. This level was intended for the upper class and included a private “retiring lounge” for the ladies. 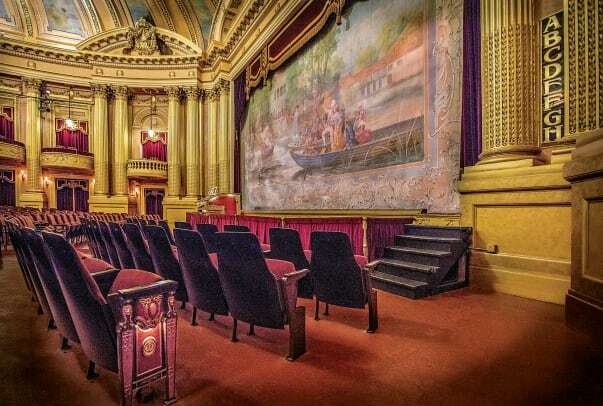 While the balcony chairs in the mezzanine are the original 102-year-old seats, each box now offers four instead of six seats in order to offer more comfort to a modern audience. “The extra seats were placed in the upper foyer,” says Rött. The two horseshoe-shaped foyers were also restored to their original appearance. “They are subtly different, but you got a better level service upstairs,” says Rött. 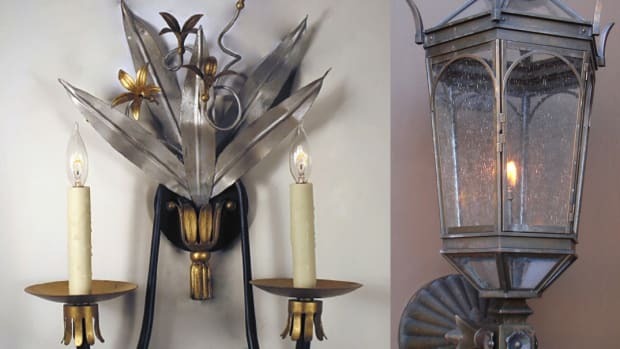 “They had been painted gray, and were dark.” To restore the decorative treatment on the lobby walls, they relied on a considerable amount of field research as well as the original stencils. 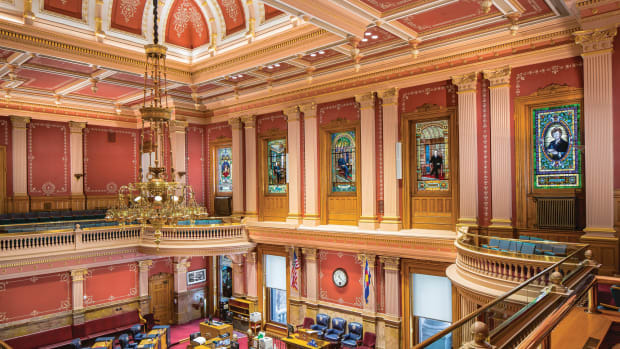 For budgetary reasons, and to save time, EverGreene re-created those in wall coverings. The restored marquee welcomes visitors to the Al. Ringling Theatre. Al. Ringling’s restored private carriage waits out front. The exterior also received some attention— masonry restoration on three sides of the building, but the main project was the restoration of the lighted marquee. It is not the original, but it was an early electric marquee that the Ringlings commissioned from Rapp & Rapp. Today’s updated version features LED illumination, some rebuilt neon and new technology to control the lighting. In addition, all of the glazing, the French doors, the transoms, hardware and wood sash, were kept and rehabilitated. The four contractors included Daniels Construction, Madison, WI; Hills Wiring, Baraboo; Pointon Heating and Air Conditioning, Baraboo; and Terrytown Plumbing, Baraboo. “The theater serves everyone,” says Miller-Lamb. “We are a small town of 12,000. There’s no civic auditorium. We do church concerts, high school musicals, choir concerts, band concerts, local dance studios, some classic films. It’s mostly for live performances. This is the stage for the city. The Ringling family included seven brothers and one sister. The eldest, C. August Albrecht Ringling was known as Al. to differentiate him from Augustus Gustav “Gus” Ringling and Alfred “Alf” Theodore Ringling. Other brothers included Otto, Charles Edward, John Nicholas, and Henry. The sister was Ida Loraina Wilhelmina Ringling. Five of the seven brothers founded the Ringling Brothers Circus in Baraboo, WI, in 1884. In 1907 they acquired the Barnum & Bailey Circus and merged to become The Ringling Brothers and Barnum & Bailey Circus. The circus did its final performance in May, 2017. The firm of Rapp & Rapp included brothers Cornelius Ward Rapp (1861-1926) and George Leslie Rapp (1878-1941) and is known for designing movie palaces in the early 20th century. They designed more than 400 theaters throughout the U.S. A third brother, Isaac Rapp, was also a well-known architect. The Al. 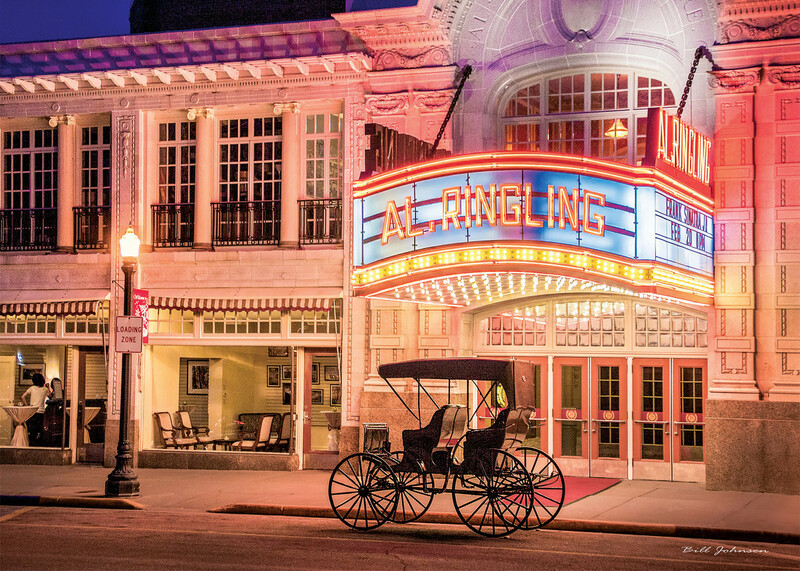 Ringling Theatre is thought to be the earliest movie palace still operating as such. An earlier theater in Dubuque, IA, the 1910 Majestic Theater was designed by C.W. and George Rapp. It was saved in the 1970s, was listed on the National register of Historic Places in 1972, and currently operates at the Five Flags Center.